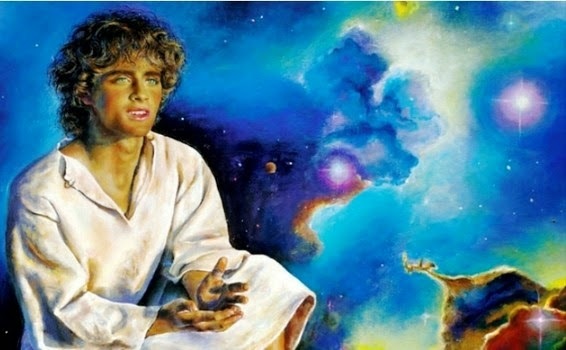 'The Lost Years of Jesus,' painted by Akiane Kramarik at 10 years old. Prints available for sale at Akiane Gallery. Those of you who have not seen the 2014 film ‘Heaven is for Real,’ I hope this article does not spoil it for you when you do actually watch it. There is this by-now 20-year old artist and poet by the name of Akiane Kramarik who, as a four-year old child, was supposed to have been spoken to by God Himself and encouraged to paint her visions. Wikipedia, on the other hand, described them with no such euphemism and said outright that they were atheists. Her mother Foreli was brought up in a communist Lithuanian society that was still very much part of the Soviet Union. Her father Mark was a non-practising Catholic. Both maintained that the subjects of God and religion were not discussed in the household as Akiane grew up. However, they subsequently became Christian converts, encouraged to become so by the child prodigy’s paintings. These she began creating as a four-year old child with anything that she could lay her hands on: lipstick, charcoal, candlewax, fruits, vegetables and pencils. As a young artist, she was completely self-taught; and drew and subsequently painted from an urge to create impressions of invisible realms that she was seeing in her mind. Her paintings are available for viewing and categorised by year in the web site Akiane.com Gallery. The movie ‘Heaven is for Real,’ however, is not about her. Instead, it is about a pastor’s son named Colton Burpo whose appendix ruptured when he was four years old. He became dangerously close to dying while at the operating table. At no point during the operation was Colton clinically dead; but the young boy was nonetheless supposed to have experienced what is called a ‘near death-experience.’ His recovery was considered by locals as miraculous; but the things he talked about after he had recovered from the operation proved challenging for his father Todd. The boy described levitating out of his body and observing the doctors working hard to ensure that he would pull through. He described having met his great grandfather, whom his father Todd used to call ‘Pop’ but whom Colton himself had never met. He also spoke of meeting a sister whom her mother lost before she was even born. Although a Christian pastor, Todd struggled to come to terms with all of Colton’s revelations, particularly as the boy was never clinically dead during the operation and, therefore, of a different case from all others with documented near death experiences. Most of all, Todd was puzzled by Jesus Christ’s eyes as Colton described them, something one associates more with the Scandinavian race than the Semitic race of which Jesus is generally accepted to have been part of. Years later, however, Todd would come across a CNN interview with Akiane Kramarik, which showed the artist’s painting ‘Prince of Peace.’ The painting was supposed to be Akiane’s portrait of Jesus Christ; and when Colton saw it, he confirmed that it was an accurate picture of Jesus Christ as he remembered Him when he was on the other side. “They finally got one right,” Colton was supposed to have said. Todd and Colton Burpo’s story is told in the 2010 New York Times number one bestseller ‘Heaven is for Real,’ something which would be interpreted into a beautifully crafted and sensitive movie of the same title by Randall Wallace in 2014. If you have not seen the movie, I suggest you go find yourselves a copy. It will be well worth your time.